Yesterday I held my third book in my hand and STILL it hasn’t sunk in that I actually write books! I like the fact that you state that BEFORE you check emails etc. write something. It’s amazing how practical that advice is and how seldom we follow that. The biggest distraction to a writer is social networking etc. Yep. It is for me. I am a writer. Now, I need to live into that reality. Tomorrow will be fun! You are right, Jeff! I no longer want to live with the desire to “have written” I want to live as a writer, writing everyday! Thanks for all this encouragement! It sure looks like a lot of folks are jumping on board! Yes! To truly live as a writer is what I want too! It does look like a lot of early birds will be pecking away tomorrow morning. My best writing time is usually between 10AM and 2PM–Right smack in the middle of my day job! But I do better earlier than later So after my regularly scheduled time with my Heavenly Father I’m going hit the keyboard! Go get ’em, Writers! You can do it! I’m often up hours before my alarm goes off because ideas wake me up. Sadly, I don’t always dedicate that time to writing, so I’m going to recommit. First, I’m going to bed early enough to get up at 4:30 AM, and second, write for 2 hours. Then at 6:30 AM I’ll head off for my walk as usual. Thanks for the challenge Jeff. Well everyone, best of luck. It is time to walk the walk… 5am it is! Love how so many of you are going for it. Rock stars, I say. Rock stars. I am not a morning person. I work swings, so getting up before 6 is risking sleep-deprived psychoses. However, I have proven over the past 3 days, I can make time to write. Yes, I have to get up and get going (I need the routine), but I can do it without shutting off from my family. I also decided that in order to believe, I need to stop spending most of my energy on trying to silence the inner doubter. Instead, I need to lean i to the belief that I am a writer and go ahead with pen to paper/fingers to keys. Oh wow! TWO hours?!? I don’t know about that. I’m seriously struggling with the 6am hour as it is…I will give it a try though. Tip: Go to bed early. Scribble if you can, write if you must! hmmm. Managed to get two friends to get onboard! This is so awesome and it makes me so happy when I can encourage people to participate in something like this! small world. can’t believe how many people are going thru this. seriously blown away. My alarm will be set to 3:45am for tomorrow. God help the people in the office. Be afraid worker bees, be very afraid. Does it count if I go to bed two hours later instead of get up two hours early? nope. not tomorrow. give it a try. I’m swaying between two thoughts here. One: Are you serious?! I just starting getting up at 6:00 and now you want me up at 4:00? What do you want me to write junk? Ha, ha, ha. Thought Two: You know what? This just might work. Besides, I could always edit later. Right? MTeresa…yesterday, I just pounded away at the keyboard right after I read Jeff’s first email for #15habits. I edited it later in the day. I was pleasantly surprised at the few nuggets that emerged from my fog. You can do it!!! Having a good writing group helps keep me on task and also identify as a writer! It’s easier to see myself as a writer when a bunch of other people also identify me as a writer and help me to do the writing. A dear friend and invaluable crit partner of mine just started a writing group, and our first meeting is happening in a couple hours. I’m super excited. I had a great day yesterday as I announced my revelation. I had already started stewing about the believing part and I am making progress. However, I had a setback today, not feeling well. I think it might be counterproductive for me to wake up 2 hrs earlier but I will commit to writing 2 hours sometime. yep, could be. take care of yourself. also, go to bed early. I write late at night, but I’ve been wanting to switch to a more ‘alert’ time. So, I’ll be up tomorrow! I get that. I bounce back and forth between the two. Thinking ahead to tomorrow morning. I envision lots of houses and apartment buildings aglow with the soft light of computers, laptops and tablets. Papers and pens will bask in the warmth of desk-lamps. Add to that the smell of coffee brewing and the sound of some really big yawns as sleep is rubbed from our eyes. The world will be a brighter place because a thousand writers will be — writing. What a mental image to behold. Isn’t it funny how just a generation or two ago sleeping past 7 AM was barely heard of! Fine, I will give it a try, but this stay at home mama is none to thrilled about it. Sleep…maybe it is over rated? I love it. I’ll be one of them, much as I hate mornings. Well, I don’t hate mornings, I just hate getting up! And no one will comment on Goin’s blog until after GMT 0800. Wait that is in just 4 hours. Of course if we are writing for 2 hours before we read Day 3 and comment. Jeff will be waiting, “Have they bailed on me”? Is there a prize for the first person to complete the task and comment with chest puffed out pride? Do we need to write dressed for success or just fake it? I should get to bed! Loving this habit. It’s definitely one of the harder ones to conquer, but one of the most important ones to conquer. However, it’ll be one of the best victories I’ve felt in a long, long time. And Jeff – If you get up with me, you might want to get to bed soon.. I’m about 7 hrs ahead of you if you CST like Memphis (where I’ve lived most of my life)… I’ll say you’re up with me in spirit because I don’t expect you to get up at 5am or 6am Central European Time ! 🙂 And thanks for the comment on the blog earlier today! Really made my morning when I woke up and saw them. The hardest part of this challenge it believing in myself and believing that God has given me something of value to say. I do try to challenge myself and write at least every other day for a few hours but to say I am writer is hard. Sharon – I think we ALL have something of value to say. I pray that He puts a thought on your heart that you can share with the world. I believe He will. Tomorrow is my cycling morning with a few buds at 6am. So that makes it 4am for me. I’m already a morning person but c’mon Jeff! OK … I’m in. Like Shawn … I love a challenge. BTW, I am a writer. I’ll be honest, Jeff. It sounds crazy. But it just might work. I’m ready to try. Thanks for going there with me. What wonderful time for the challenge. I am a writer and haven’t been lately (for a long lately). Every time I see one of my mentor type friends they ask me about my latest book and I just smile and say not yet. I am currently working in Japan for the month and wake up several hours early. Tomorrow I will use those two hours to write and the opening of my new book has been knocking at the edges of my mind for a while. Thanks so much for the challenge – what divine, awesome, perfect timing. 3 am is going to come early but I’m putting it before my workout and daily readings. I never do anything before those two are done. I am a writer! Mr. Goins, I owe you a debt of gratitude! Today I marinate 😉 Tomorrow I write! I blogged about this (it’ll post automatically tomorrow). I am compromising, since getting up early to write won’t work for me. I’m still going to be setting aside time for writing in a way I dont normally do though. My biggest problem will be all the little ways I rationalize to myself in the morning that I need more sleep. Having 3 littles who are able to crawl into my bed just makes this task extremely difficult. But, in reality, if I push back against that and even help THEM to develop habits of staying in their own beds, giving me my own time, respecting my writing-it will certainly make for a happier and healthier family life. What I need to keep telling myself is that this writing thing is like a career. I wouldn’t call in sick to work just because I had a rough night’s sleep, or my kid woke up 3 times with nightmares. I would grin and bear it and find ways to deal with it so that I could continue performing at my place of employment. I should apply these same principles to writing. I have written 40 articles that have actually driven folks to action and made a difference in their lives. If I hadn’t written and shared those articles, no one else would have. Folks have actually read them and asked me to speak on these topics. In the last 5 days I have written 10,000 words toward my first book. I am writing about Stewardship and Generosity and start off the book with the end of the global financial system from Revelation 18. I am posting thoughts as I write on my blog. I never aspired to this or anticipated that it would happen but somewhere along the way I have become a writer. Thursday is my early day. Thanks Jeff for making it even a bit earlier. I signed up for a challenge, I guess I can’t whine about my own choice. Thanks in advance for the early start. I am a writer. And tomorrow, I’m going to be a very, very, VERY sleepy writer. Maybe I should give my Keurig a heads up? What if, over the summer break, which has just begun in our neck of the woods, one has no specific waking time? Yes, it is a HUGE luxury to NOT have a set time to get up for the next 10 weeks but does that mean ANY time I get up could, for all intents and purposes, be getting up 2 hours early? ;0). We shall see how convicted I am come sun up! BUT the truth that in order to BE a writer one must indeed WRITE…that I cannot argue with or finagle around. I will write for 2 hours tomorrow! BEFORE any other computer “stuff”. Get up two hours before everyone else does. The point is to make room to write. Oh, and I am unsure how to contact you re email notifications, but I am not receiving them though the site says I am signed up. If you could check on that it would be appreciated. Tks. You need to update your profile settings. Try opting in here: https://goinswriter.com/subscribe and when it gives you an error message, click “Update Subscription Preferences.” Then, check the box: “Daily Updates.” You’ll get an email tomorrow. Much to my surprise, I had a huge revelation today about my belief in my writing. The revelation itself startled me but there was no doubt in my mind that it was true. I know it isn’t the whole thing, but it’s a good start. I came to this conclusion through meditation and many of the comments shared by other members of this wonderful group. Best of all, the revelation will help me focus on and practice the conclusion to this revelation by the two hours’ early writing session tomorrow morning. It doesn’t get much better!! Query letters are overrated. Build a platform. So now, the coffee maker, the alarm and my heart are ready for my early-morning wake up call! Writing first. Email second. My piece on today’s assignment…. fear, belief, vulnerability… and early morning desk time. I get up at 5:35 so I can have my quiet time before the whole house is awake. 3:35 sounds just terrible. Do writers take naps? Contemplating. I’m more of a night owl than an early morning person, though I already wake up at six. I would argue that I should stay up late and write, knowing that worked perfect when I had young children. However, now that I’ve grown sons, I’m the first in bed at night and I go to bed about eleven! Mornings are definitely quieter, though the time is hemmed in by the need to go to work. What to do? I’ve been contemplating this off and on during the day. The thought of waking up earlier and knowing so many others are up writing has such a great ring of community to it. After mulling over it during the day, I’m going to opt for waking an hour early, at five. At least I’ll try it and see if the brain juices can actually flow at that hour. Four o’clock? Well, I still need to function at work! This is a real challenge for me. I have a problem getting up early, but I will give it a try. I believe I am a writer, but I seem to go days where I do nothing more than think about writing. So tomorrow I will be at my computer at 3 a.m. proving that I believe I am a writer. I toast everyone who also believes. I guess I should have read this challenge before 10 o’clock at night! And I’m just reading this now? I missed the chance to write first thing this morning (barely making it to work on time as it was), but that experience still came with its own takeaways: https://slicedupfor.me/writing/2012/06/06/caught-the-worm/. Totally cool. Tomorrow is another day. It’s only day 2 of this challenge, and I’m already learning important lessons and seeing important changes. Here’s my article about how I do indeed believe. Love that you’re seeing changes. Absolutely amazing! I put out a target to start writing a blog and initially I had not platform or decent web site design. Most important insight: Sometimes you have to start delivering without having a super polished appearance. My reward has been a blessing beyond measure. Blogging has helped me organize my thoughts and the routine to write daily about topics that are dear to me has helped my realize that I am totally capable to deliver. Genuine and sincere content written with no other agenda other than serving others with it. Wow! Great times! I wish the early thing worked with my schedule (looking at ways to make it possible in the future), but for now, I’m carving out time to write in ways I never have before. And it feels great. That alone, is helping me start to believe. I believe. And not just because I’ve already have two articles published in the last month. I believe because when I write, it’s just so right. The rest of the world falls away. Lately I’ve been at work and daydreaming about my writing. The blogs I want to write, the articles that will be due in a few weeks, the guest posting I’ve been asked to do. Not looking forward to waking up at 5:30 tomorrow. I am looking forward to writing, though. And having coffee. See you all tomorrow! This is so exciting. The best thing I’ve been a part of in a long time. Awesome. I was up, too. In other news, we’re out of coffee. I had quite the “aha!” moment today. Really enjoying the Great Writers Series! Very timely for me. However, I must say, it’s more challenging (for me) to believe I can get up two hours earlier than it is to believe I am a writer! 😉 But, nevertheless, I believe! I’m finally believing that I am worth calling a “Writer”. I’m up, I’m up. Well, now is a little bit past 7, I’ve been up for two hours already and finished my writing. Probably I will repeat this in the next days… I feel so full of energy right now! I will get up and write and not listen to the birds. I will get up and write. Remember the children’s story of “The Little Engine that Could?” I think I can. I think I can. I think I can. Later – I knew I could. Hopefully that will be me. Couldn’t quite do it for the full two hours (I have a short attention span), but got 2 Blog Posts drafted. I had lots to do this week, so to get another two out of the way is great. They will need some tidying up, but I’m now ahead of the game. There is nothing more perfect and rewarding than getting up with dawn to welcome the rising sun, to walk in the garden, or around the neighborhood, to put pen onto page! It sets the pace for the whole day, especially if you do it alone, while everyone else is still sleeping. That is the time when I write my best…or rather, when my soul returns from her nocturnal journey and pours on the paper words and sentences and thoughts that have nothing to do with the mind and the ego, words that play wonderful music to the strings of the heart. At that early hour, whatever is written, is good and makes me believe in me…my soul…I like it, others like it because it comes from above or deep from within and I, my big ego, cannot take any credit for it. Whenever I decide to write during the day, when I make plans and try to think, I fail! Nothing flows on the paper…it is a struggle…and the results disasterous. Because I could not get up early for a while, I stopped writing. Now I know I am falling into my old rythms again. Thank you Jeff!!!!!!!!! Good luck everyone! Bright and early tomorrow morning! <—Also have an infant along with a crazyman toddler who doesn't always sleep much. So I stayed up late tonight and wrote! I am a writer. I will also get up early, though it might not be two hours. (Whenever I wake up, the baby does too!) And, yet, I am still a writer. I love this challenge, though. Though it's "easier" in a way to stay up later, I prefer getting up earlier. Thanks for this series, Jeff. Since I’m working four twelve hour night shifts this week, this is a little problematic. However, I’ll sleep my usual 10-2 and write when I would normally wake up slowly with my coffee and social networking. More coffee works every time. I struggled a lot with the idea of belief. I have always struggled with this idea, but believing in myself as a writer has seemed especially hard today. I blogged about it, and made a deal with myself: if I don’t get up, I don’t believe, so I damn well better get up! I set my alarm two hours early today but struggled to get up and write. I didn’t sleep well (I rarely do) and was shattered. I didn’t have the energy to get up yet alone think or write. However it has made me see that the best time for me to do this kind of thing is late at night – when I would normally stop writing and veg out before bed. So tonight I will do that. I will sit down and turn all distractions off, and simply write from my heart abouty feelings and thoughts on being a writer – I will let everything out, including any doubts and fears, and expose them. Then I will tell myself again that I am a writer – whethe I like it or not. Good for you for picking a time that will work for you, instead of just giving up. I bet your writing will show your commitment! Great, James. Can’t wait to hear about it. This was a toughie! I usually get up at 5 to write for an hour and a half, until the children start moving around, demanding attention and breakfast. So I had to wake up at 3 a.m. I didn’t set an alarm, but it worked. I actually wrote on my novel, in a notebook, in longhand, rather than checking email, blogs and Tweeting. Have to admit I then went back to bed at 5 a.m.
Congratulations to all of you who are already up and at it! I’m going to stop myself from reading all these posts until later so I can start writing now. Agreed. So much to read! Love it. While I didn’t do two hours, I did get up half an hour earlier this morning and, knowing I spend a lot of wasted time in the morning anyway, spent one hour writing. Thank you Jeff. I don’t know why something so simple seems so revolutionary. I’m a writer, so I get up early (however early that may be ;>) and I make time to write. I guess it shows how difficult it can be to make the mind shift from “I want to be a writer” to “I am a writer.” You’re the best! I absolutely do believe I am a writer, because of my compulsion to write, and from comments of others. It’s my passion! As far as getting up two hours early….I’ll need to do it next week. I’m attending a conference Thursday through Saturday, but, I will do it. Thanks for the motivation, Jeff! Cool. Lots of grace here. Yippeeeeee! I did it. My dogs woke me up cuz my hubby forgot. I was luckier than most because I normally get up at 8:30, but this morning I got up at 6:15am. I sat on the edge of my bed blearily trying to remember why I needed to be up. Then I remembered and dashed off to get my cup of coffee. I typed as fast as I could, didn’t even look at my email list, and within an hour and a half, I had finished a flash fiction story topping at approx. 1000 words. I polished it a little and then posted my comments and the story to my blog (https://fantasyfic.wordpress.com). Ask me how I feel…abso-bloody-lutely fantastic and not even tired, although I didn’t have a good sleep because of a large thunderstorm. This is what I used to do years ago, and it still works. I was delighted when I read this morning that Jeff wants us to do this for the rest of the sessions. I hope I keep on feeling this wonderful. Wow! That’s fast. Well done! Hope it felt good. OK, I did it. I hope you write something about editing as I seem to never have that accomplished. But, I did write. I am a writer. I have a story to tell. Awesome. I’m not way into editing, but we’ll cover it a little. I am so hung up on the fact that I make so many mistakes. Thank you for the inspiration. I am grateful! I read your blog entry, and wow, that was a powerful story. I didn’t see a place to comment, or I would have commented there. Nice, nice job!!! Thank you for reading it! Also, thank you for the notice that you couldn’t find a place to comment. I did not know that and wondered why there weren’t any comments. I am new to blogger so I have to go figure that out. I admit it. I didn’t get up two hours early because somehow I couldn’t face a keyboard at 2:30am; however, I got up at my usual time and wrote for two hours. It’s been a really long time since I wrote for such a long period of time. It was a good time to spend with my muse, a cup of coffee, and eventually slivers of daylight peeking through the blinds. I didn’t realize that I had to sign up for the daily updates to receive emails about the 15 Habits journey, so I’m sorry to say that I started my journey late. But in any case, I got up around 05:00 AM this morning to start writing the first chapter of an ebook I’ve been wanting to write for a long, long time. The start was surprisingly difficult as I wasn’t sure how to begin the chapter. I was close to giving up, but I pushed myself to at least put words down and not have to punish myself once the sun’s up. Thankfully, I managed to write a full page and up to 50% of the chapter done. Thanks Jeff for this. I’ll be sure to keep track of the next 15 days this time around. I did it. The good thing about having too many ideas is I can choose from any of my projects that pique my interest and go. The writing came easy today. Just discovered the challenge this evening, so did Day 1 and Day 2 all in one fell swoop. Now, I’m ready for Day 3. Setting my alarm clock for 2 hours earlier. This is gonna be fun! I arrived late to this gig, only hitting Day 1 at 6am this morning and so whilst you were all cursing Jeff’s name with early morning expletives, steering a possible renaming of this challenge to ‘Grumpy Writers with Tourette’s”, I was, contrastingly euphorically yodeling from my bedroom widow “I am a writer”. I am aware I’m on catch up and that essentially this task focuses on making time to write, just write! With that in mind, I shall all but abandon the needs of my customers today, switching phone off and loosing myself on a page. P.S I’ll get up early tomorrow I promise. WOW–this is EXACTLY what I needed to hear! I have been struggling with quite a few friends & even some strangers telling me “there are books in you to be written” and yet not really identifying myself as a writer! Striving to figure out WHAT to write about & yet learning to just write and the WHAT will come! Thanks for all that you do here, Jeff !! Believe. Today I chose to believe I am a writer. 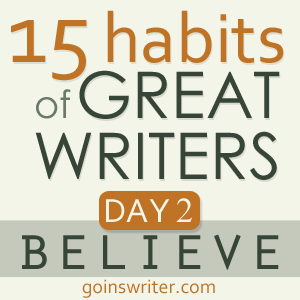 I could feel intimidated by the caliber of writers participating in this challenge. I chose not to be. Everyone had their beginning. This is mine. I do not have a degree and I am not published. Unless you accept the anonymous stories published in my elementary years. I had at one time used the term writer to describe myself. It soon faded behind other descriptions such as wife, mother of 4, home engineer, wood worker, decorator, gardener, grandmother etc.. The desire to write as never faded. It is now time that “writer” be the front runner. You are juggling lots of roles, Kim. Make your writing life one of them. As Jeff said, declare yourself a writer. But you have to schedule it too! Thanks for this challenge. It is something I need. I believe I am a good writer. I fear my writing never being published or worst, being published and falling flat! I have four projects at various stages. I need to just set some time aside each day to write. You’re welcome. I hope you finish one. Extra hours in the morning don’t work for me, but hours after the “other” job do. Plus, I’m a weekend novelist, so I write fast and furious Friday-Saturday, then rest on Sunday. Getting up early. Sigh… That is not on my list of things i want to do 🙂 I’m a night owl. I enjoy the quiet after everyone goes to bed and I’m alone to write. I’ll get up a little earlier tomorrow but not 2 hours. Baby steps! Since I’m a little behind, it looks like I’ll be waking up bright & early to prove myself as a writer. I’m not looking forward to it as I HATE mornings. But I will do it because I am a writer! After reading this, I got up and raised my hands high, looking at the sun and shouting “I am a writer!! !” And from that time I knew that I really am a writer, and no one can stop me from writing. Thanks a lot, great post! Wow Jeff…You are a complete wizard to get me out of bed at 5 am (now several days in a row). Thank you so much for your excellent daily challenges. My head is spinning with all the great inspiration. It is about how I have used visualization in my life to call forth the things I want, including my first paycheck as A Writer. I would encourage everyone to make a vision board. It’s simple, and so effective in keeping your goals front and center, and also letting them fly out into the Universe so, it too, can align itself to help you. So I’d already accepted that I wouldn’t get up early today and did my writing late last night, then I woke up two hours early without an alarm this morning anyway. ‘Course I went back to sleep, but I’m pretty sure my mind is trying to tell me I really want to do this. I promise to listen to it better tomorrow. BTW this will be in my blog post tomorrow at https://stephhwilliams.com (I’m posting a day behind). I’m behind in the series, but I am doing it anyway. So I’m setting up the alarm clock now. See you tomorrow! I go to bed at midnight or later and rise at 5 or 6. Period. Where do I find the 2 hours with a schedule such as that?